Hidden Image – What Do You See? 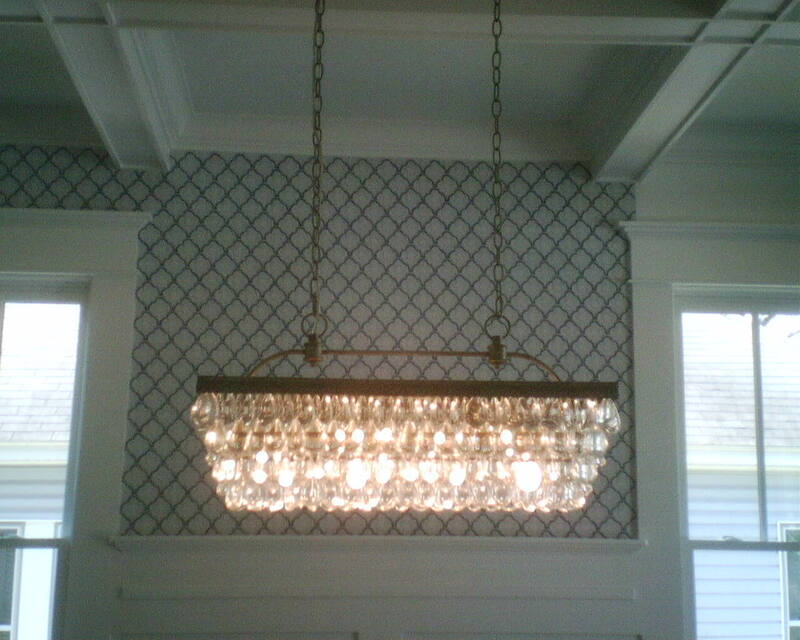 I loved the way this pattern looks in the entry of this Katy-area home. It’s funny how your mind works. 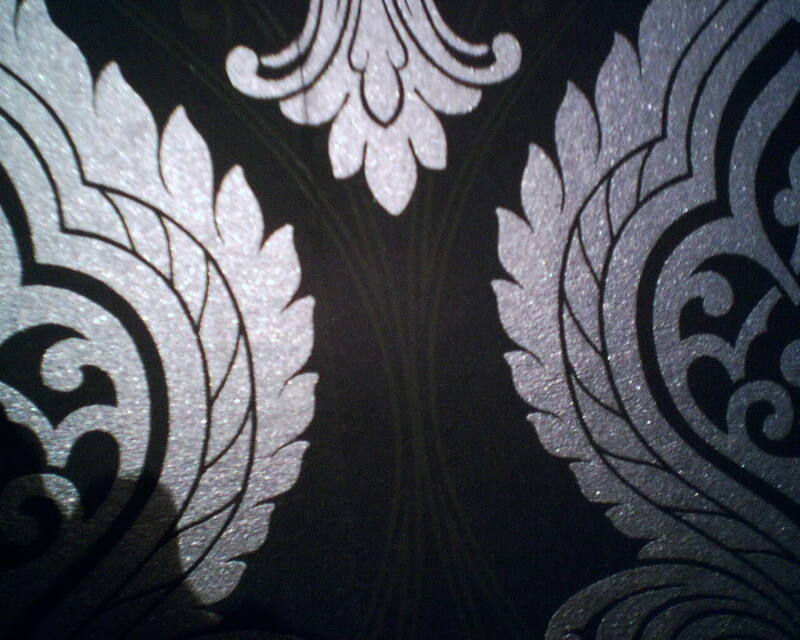 I took a close up photo of the pattern motif – and almost gasped when I saw it! 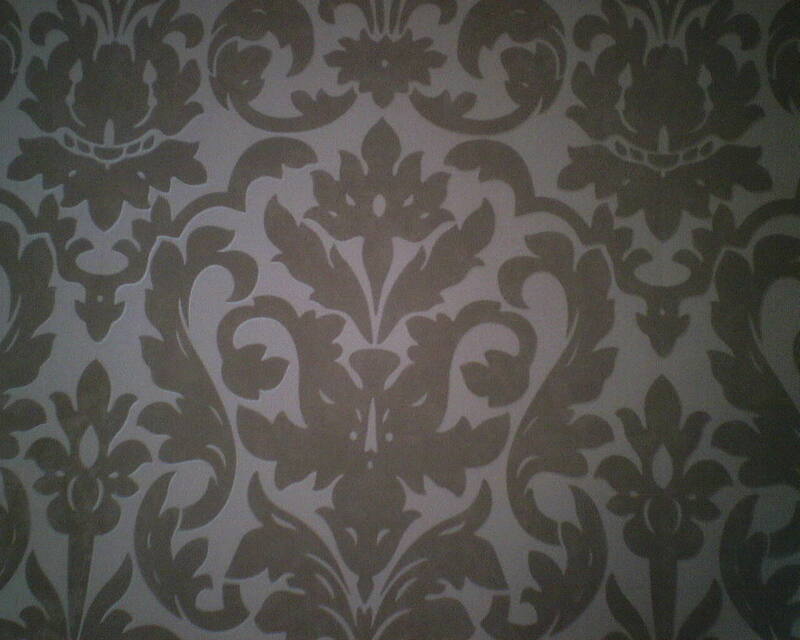 There is an image hidden in this design. At least, I can see it. Can you? Some people see a man, some see a woman. Clothing can vary, but all see the figure holding something. What do you see? Here is what I see: A king wearing a crown and beard, with a hairy chest (or possibly armor), clutching dumbbells in each hand, sitting cross legged like a Buddha. This young couple in the Garden Oaks neighborhood of Houston has a beautifully updated and furnished 1940 ranch style home. 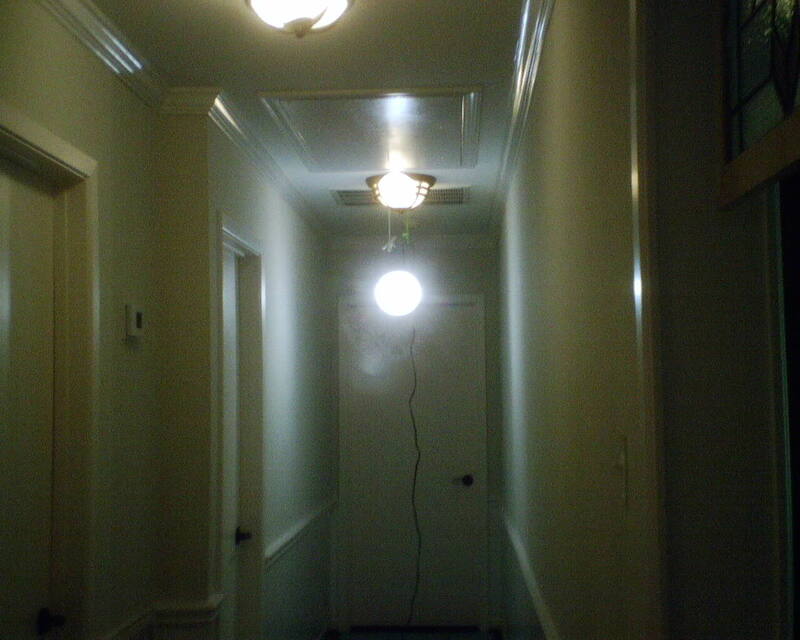 But they wanted to up the volume, so to speak, and thought that this hallway, which slices through the center of the home, would make a fine focal point. 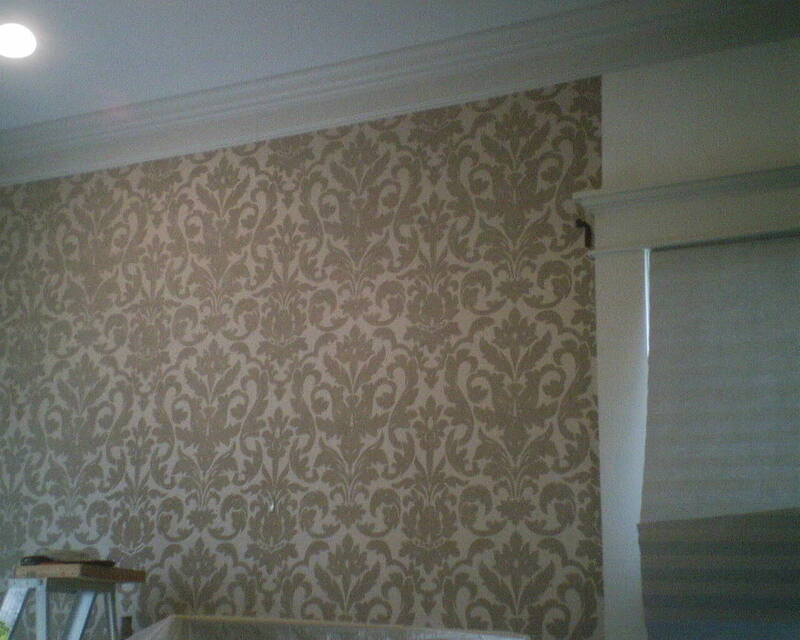 I’ve hung this classic damask pattern twice before, and was carrying around a sample of it when I visited them for an initial consultation. 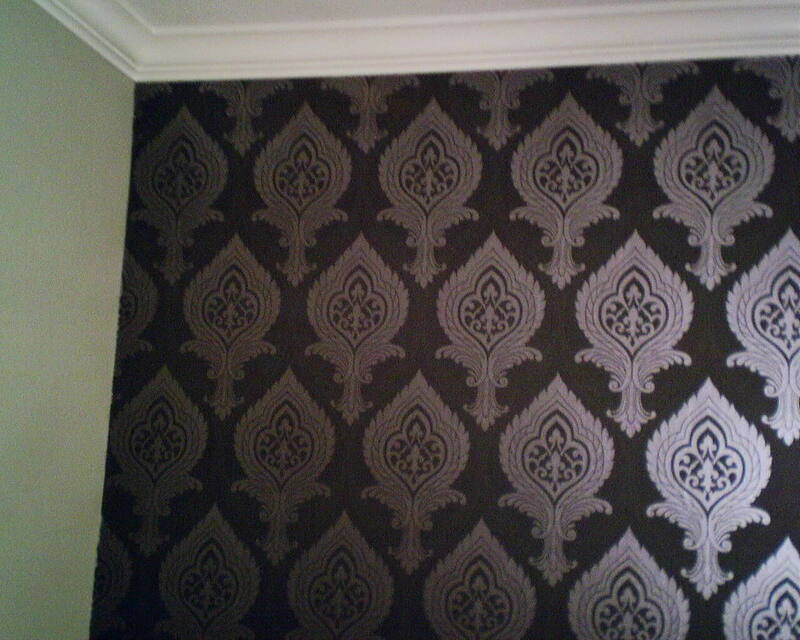 They liked it immediately, and, after considering several other patterns, decided on the damask. 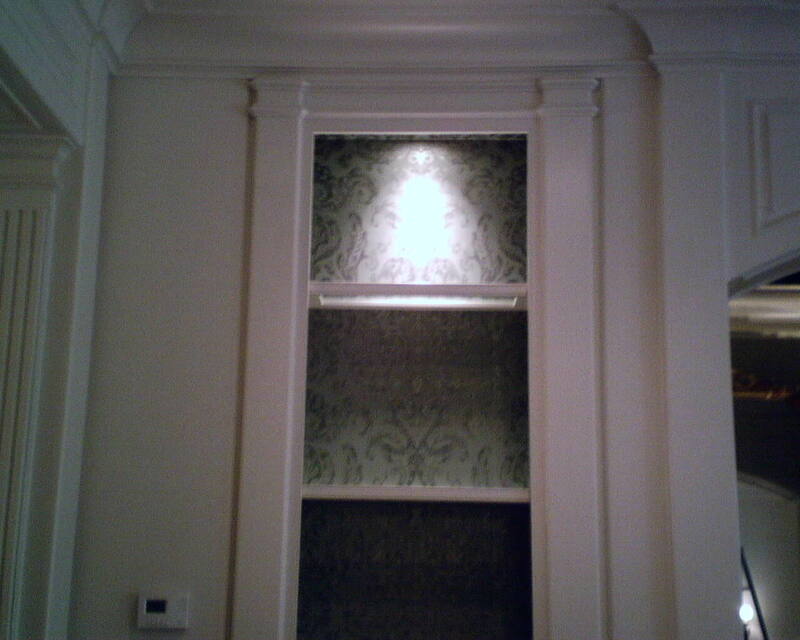 To make the area really special, they added a chair rail and crown molding. 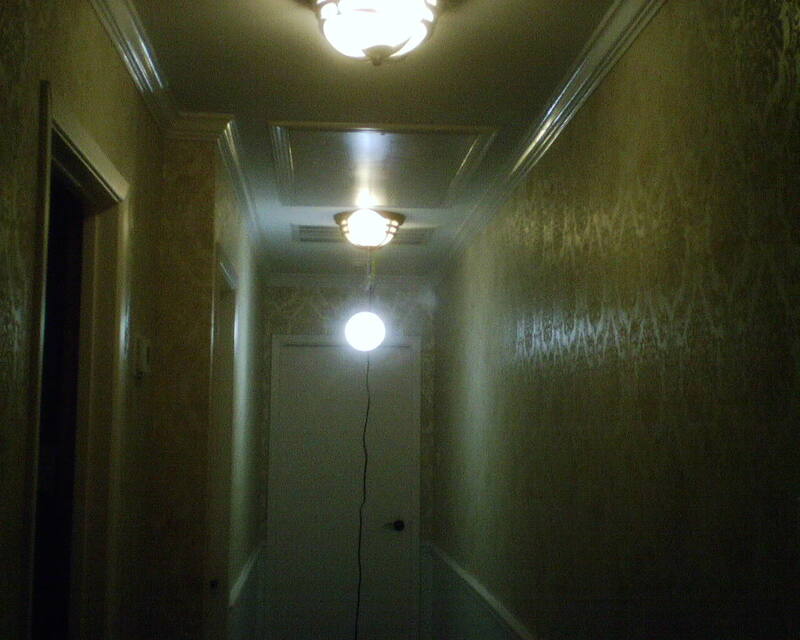 It’s hard to get a good shot of a long, narrow hallway. But you can see how the color and pattern adds warmth and dimension to the space, and the lightly pearlized shimmer of the paper definitely adds a touch of understated glamor. 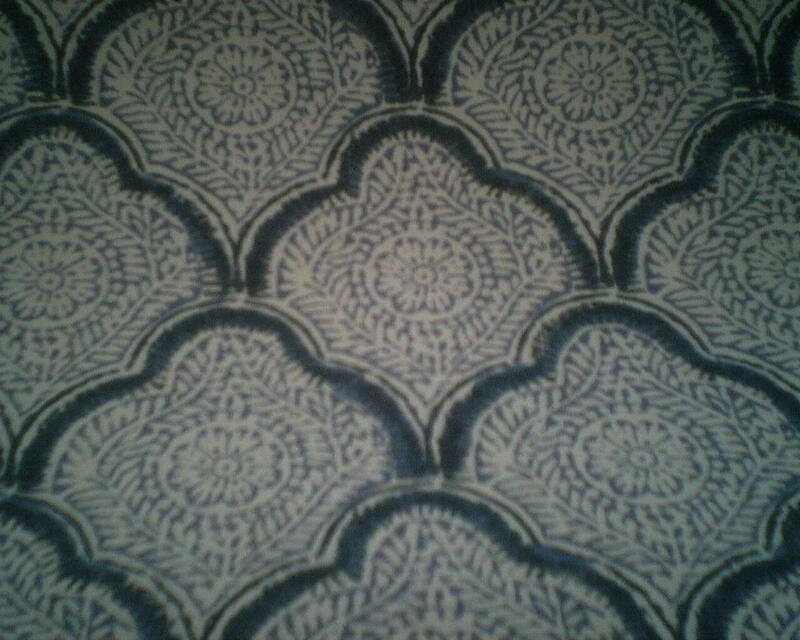 Since the chair rail was a main feature of the room, I positioned the pattern so that the bottom of the damask motif landed just above the chair rail. 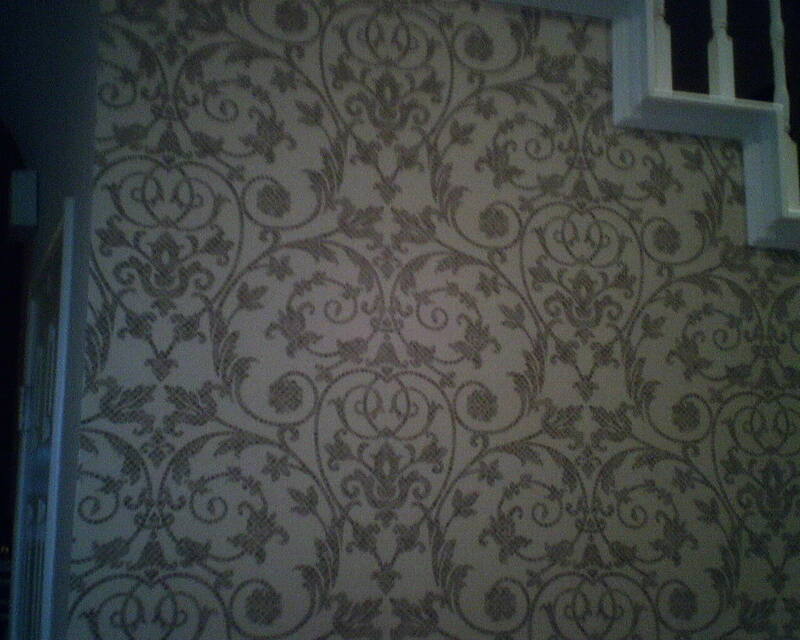 Likewise, the top of the motif sits just below the crown molding. 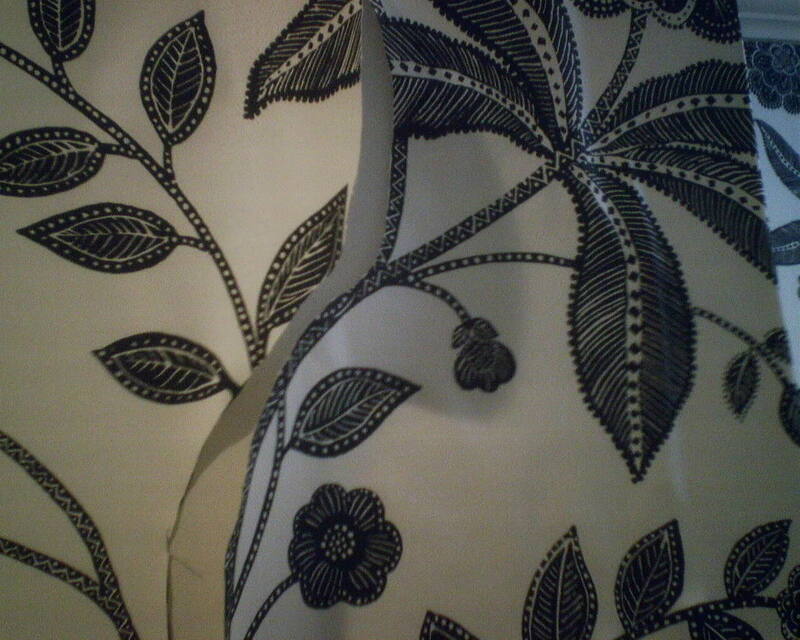 This looks a lot better than having part of the design chopped off in mid-motif. 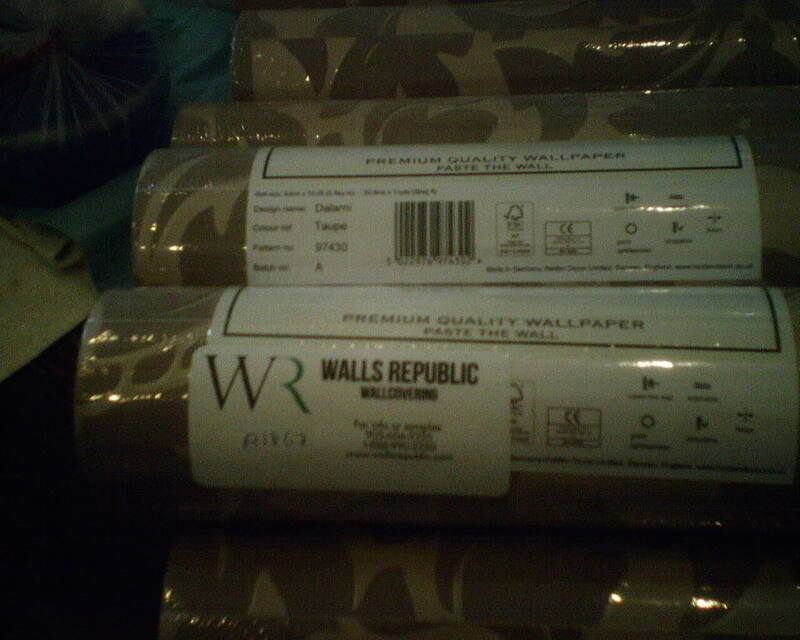 This wallpaper is by Designer Wallpapers, and was delightful to work with. It was bought at below retail price from Dorota Hartwig at Southwestern Paint on Bissonnet near Kirby. (713) 520-6262 or dorotasouthwestern@hotmail.com. She is great at helping you find just the perfect paper! Discuss your project and make an appointment before heading over to see her. 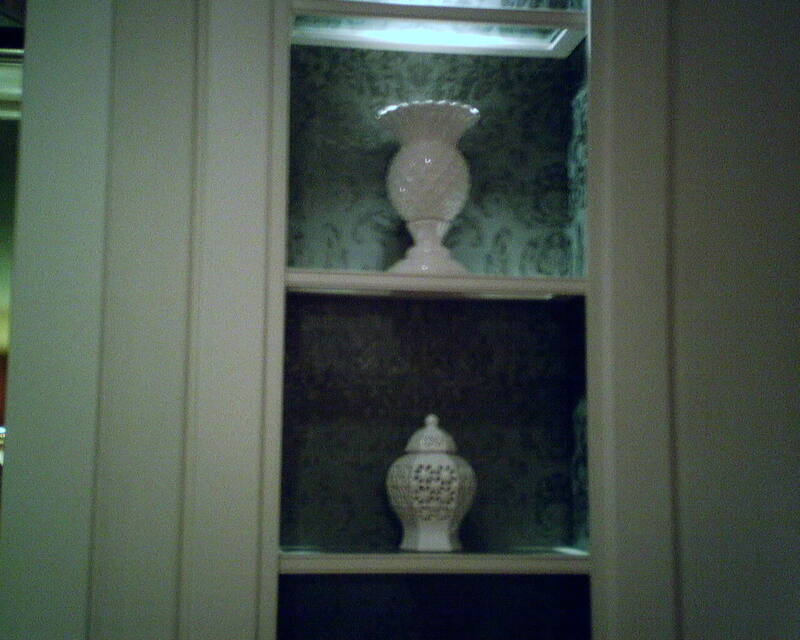 In fact, the couple is going to meet with Dorota tomorrow, to choose a complimentary paint color for the bottom portion of the walls. 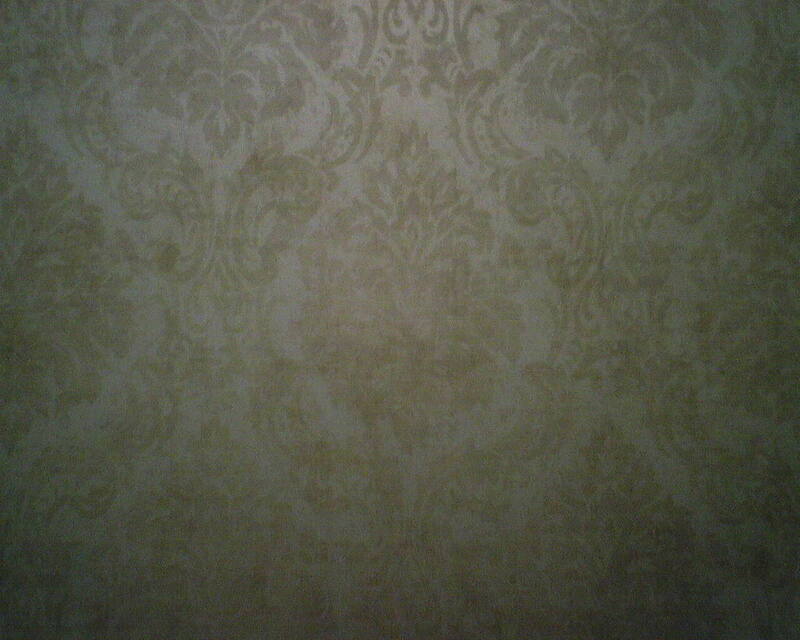 The “kill point” in a room is the last corner, where your last strip of wallpaper comes to meet up with the first strip. It almost always results in a pattern mis-match, so you try to hide it in an inconspicuous place. All of the corners in this bedroom went floor-to-ceiling, and the eye would really notice a 10′ mis-match. 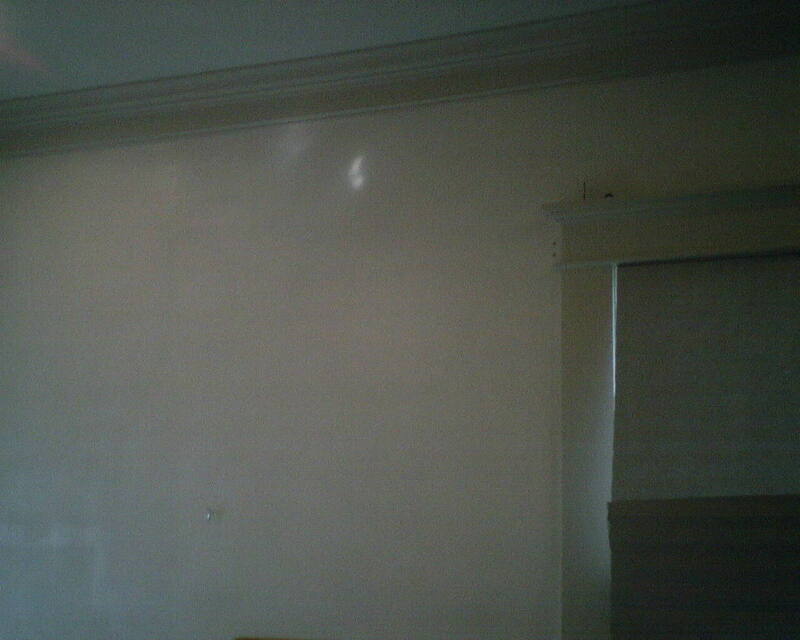 So I put the kill point at the top of this corner, about 2′ of mismatch. Then I wrapped the rest of the paper around the corner as I normally do, ending up at the right edge of the door molding. 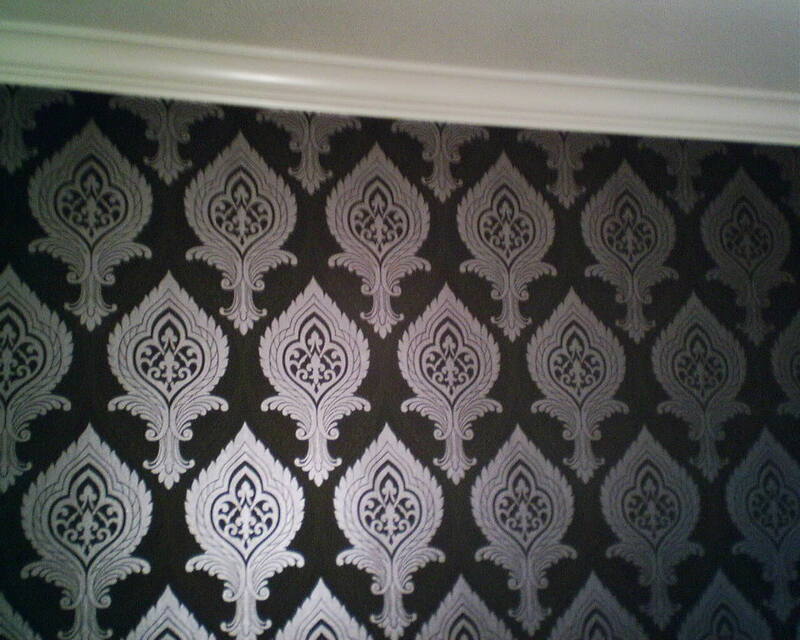 This way, I was able to keep the pattern matching perfectly for the lower 8′ of the corner. Where the lower paper meets the strip above the bar of the rolling door, the thick bar hides the 3″ overlap and mis-matched design . The pattern motif below the bar does not line up vertically with the motif over the bar, but who the heck is going to notice that? 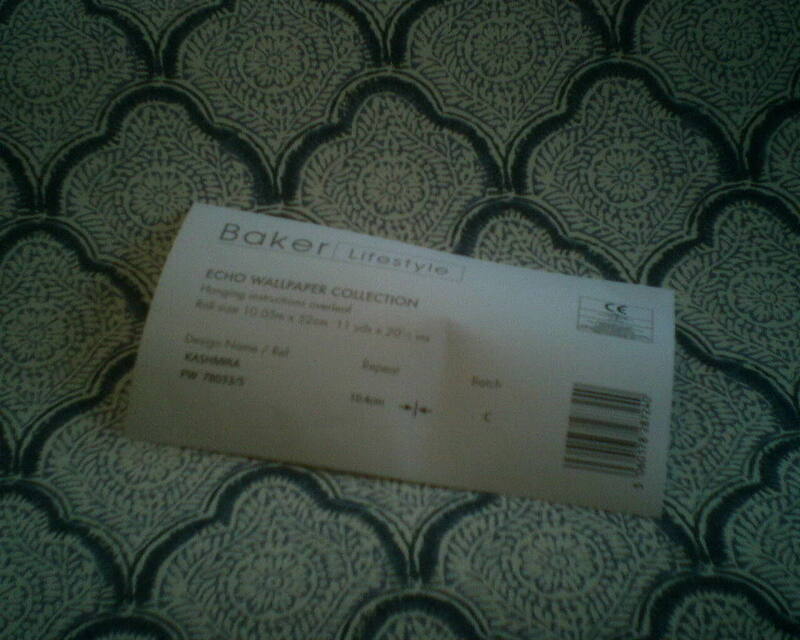 And even the 2′ of mis-matched design at the top of the corner is hardly noticeable, due to the busy pattern. I apologize for the dark photo, but this is actually pretty cool. 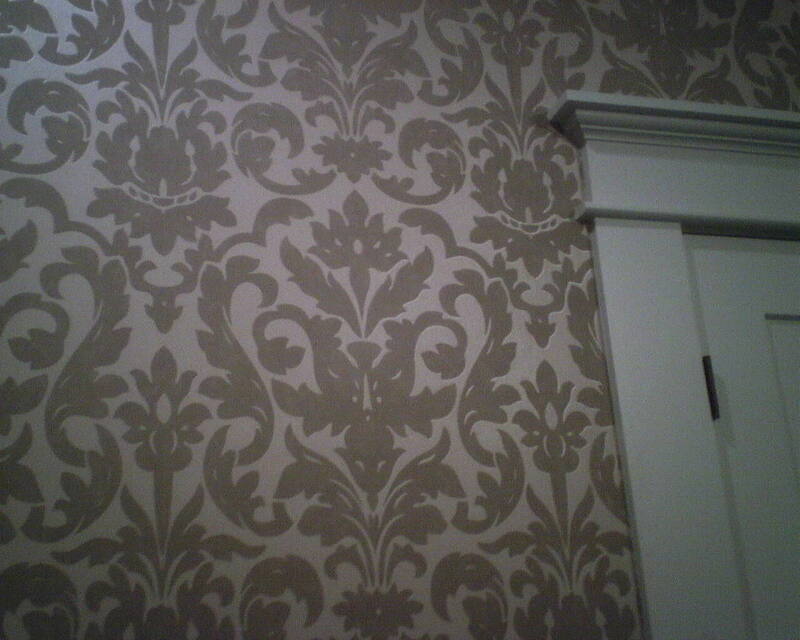 The kill point is the last corner in a room, and the wallpaper pattern virtually always ends here in a mis-match. 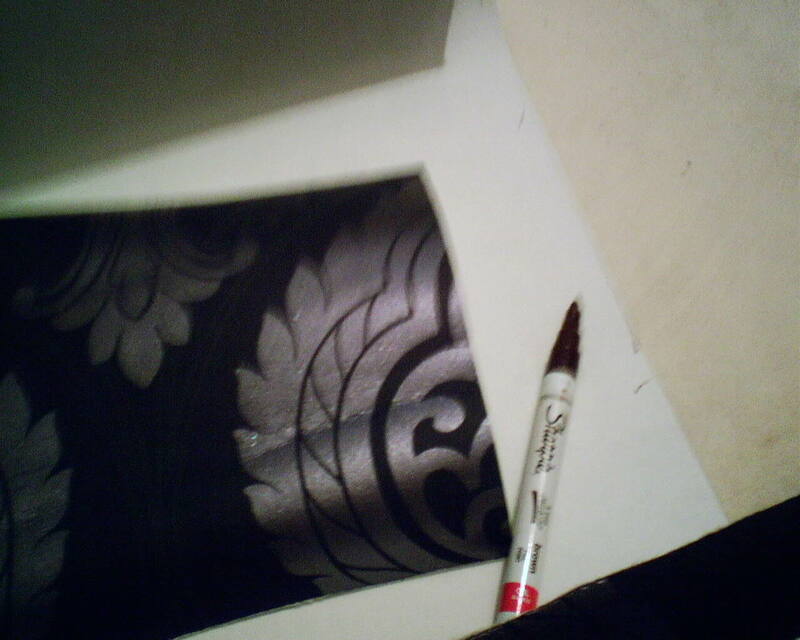 But today, the last corner matched absolutely perfectly. That is VERY rare! 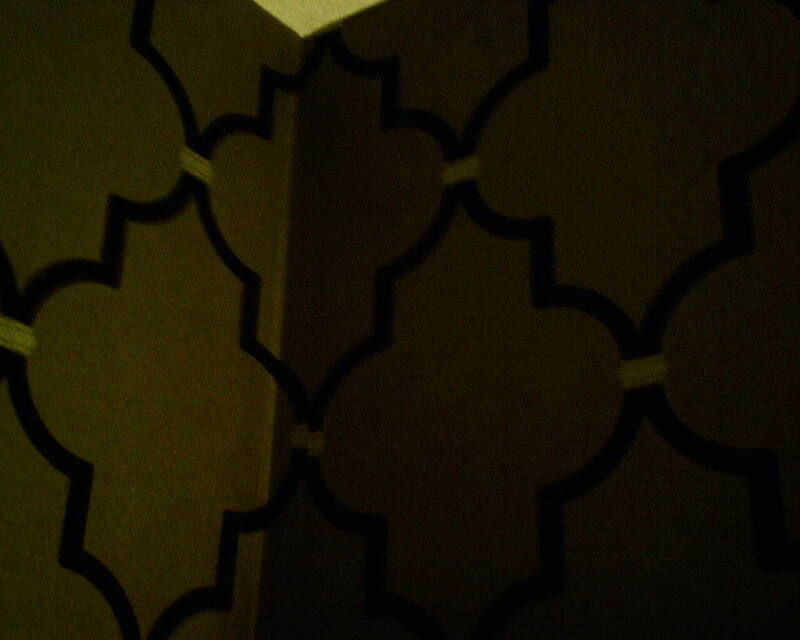 It is just a chance of fate that the pattern on the right got cut off at exactly the same point as the pattern on the left, so when they met in the corner, the match was perfect. But, well, it didn’t exactly happen all that easily. If you look closely at the wall on the right, you will see that the pattern is a little lower than the pattern on the left. 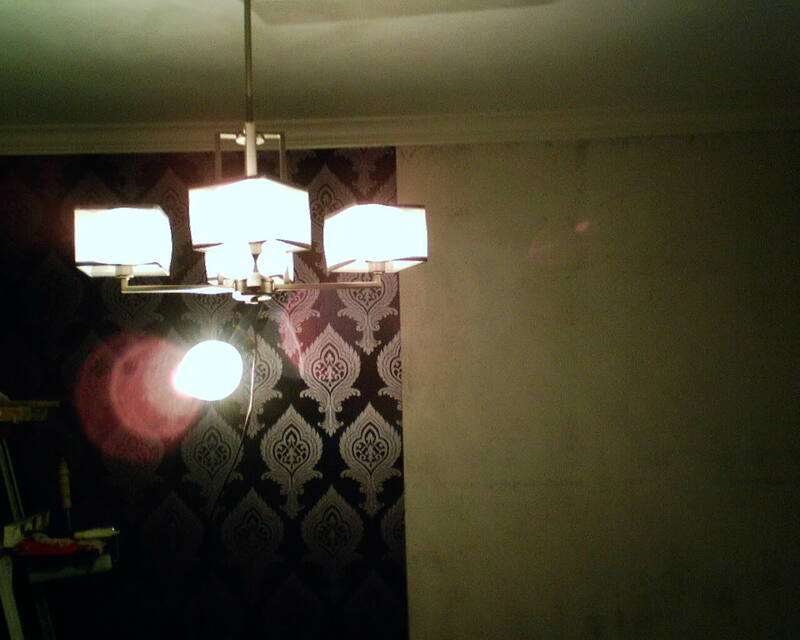 That is because the corners of the room were not plumb, causing the wallpaper to hang crooked, and when that happens, the pattern will travel up or down hill at the ceiling line. 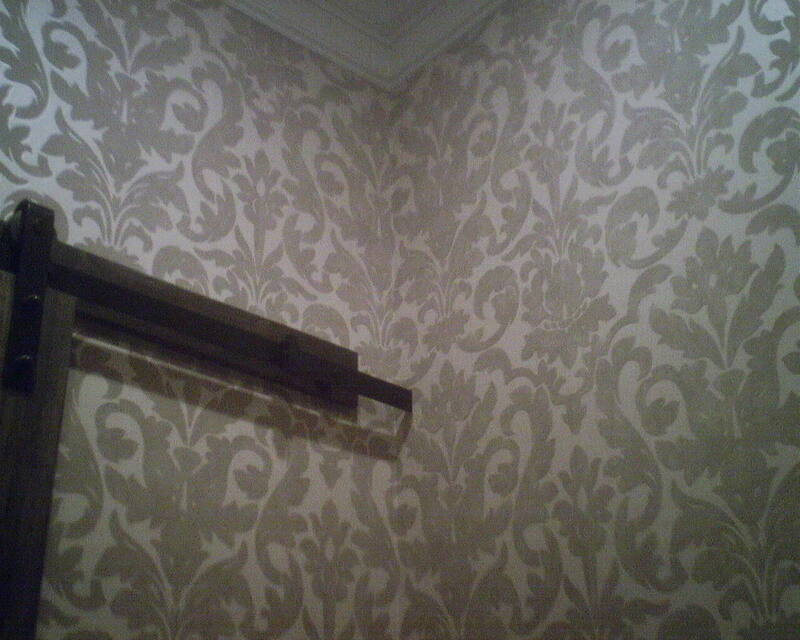 I think it’s more important to match the pattern in the corners as precisely as possible, even if it means that the pattern is not straight along the ceiling line. 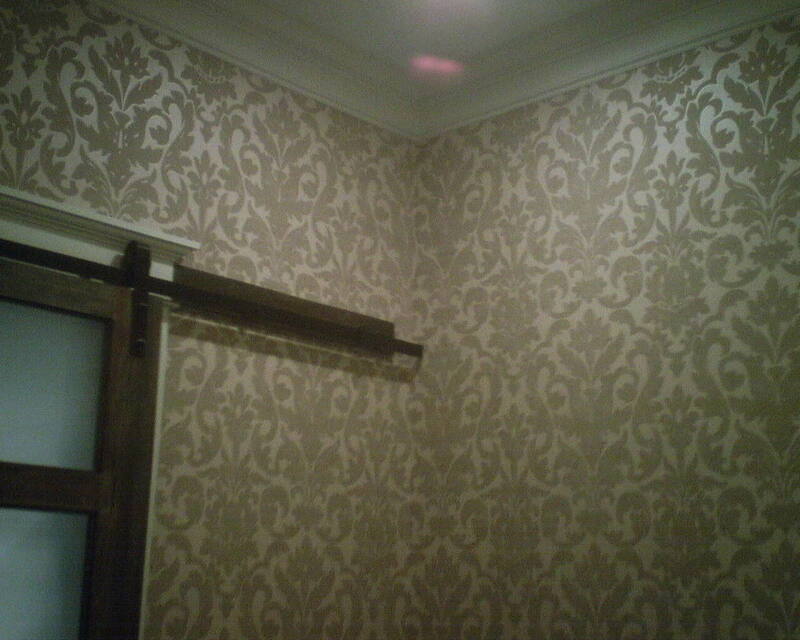 Because this is so common, we try to make the pattern match best at eye level, and hope that people don’t spend too much time looking at the ceiling line. 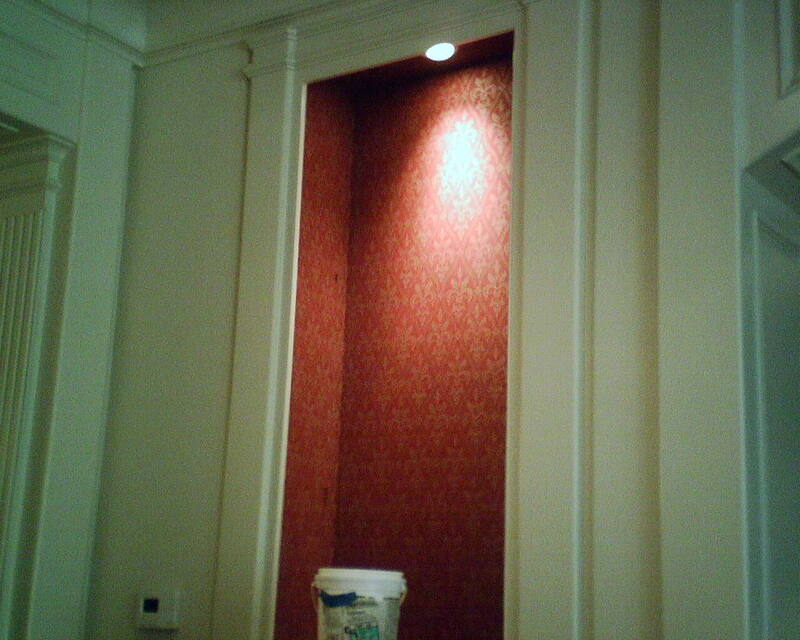 Anyway, as you move around the room hanging paper, the other walls may be out of plumb, too, causing the subsequent strips of wallpaper to go off-plumb, and then their pattern will also travel up or down hill. That means that, by the time your last strip butts up against your first strip, your horizontal lines may not line up. And that’s what happened here. But you hardly notice. Why? 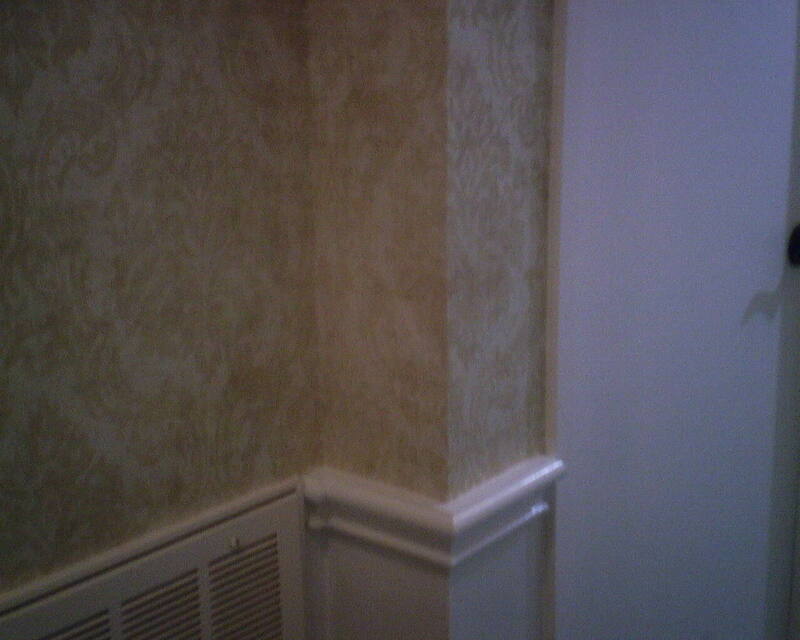 The wall on the right has a seam about 2″ from the corner – right were the two motifs meet. When I had the pattern perfectly matched across this seam, the silver “ring” at the join point matched perfectly with the one on the previous strip, but the black lines from the trellis on the right did not line up with the black lines on the left. 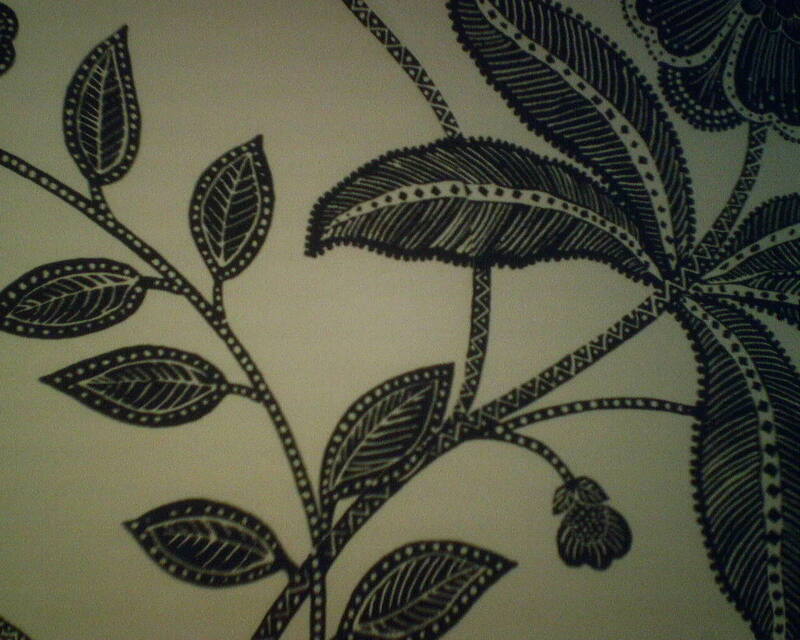 So what I did was, I carefully removed the narrow 2″ strip of paper and slid it a little higher on the wall, matching it to the black lines on the pattern on the left side of the corner. This threw off the match of the silver rings on the wall on the right. But, hey, it is only slightly off, and it’s 7′ high and over the door, so who’s gonna notice? But if those black lines on the trellis motif mis-matched, people would notice. 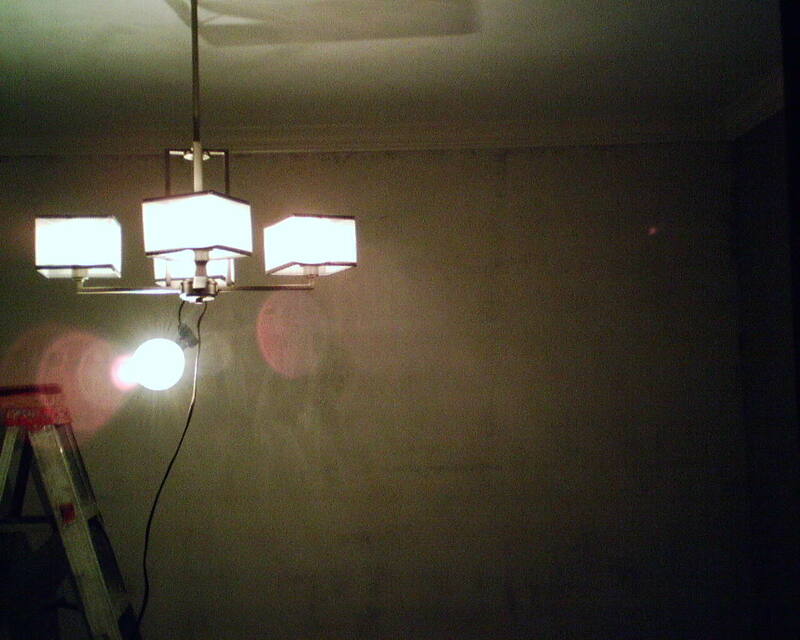 This was a small adjustment, but it made a world of difference in how the finished room looks. 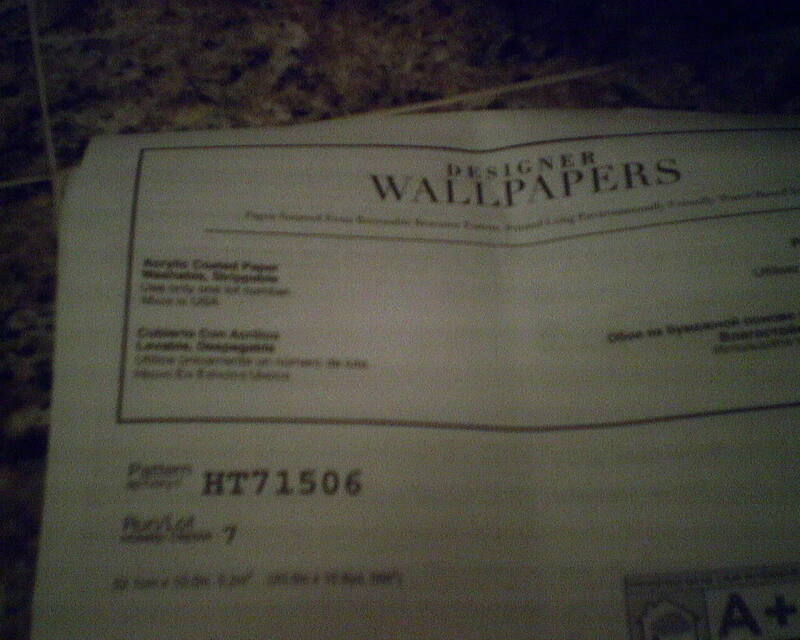 I realize that this is the kind of post that only a paperhanger could follow and appreciate. But I was just so excited today, to be able to have a perfectly matched kill point!